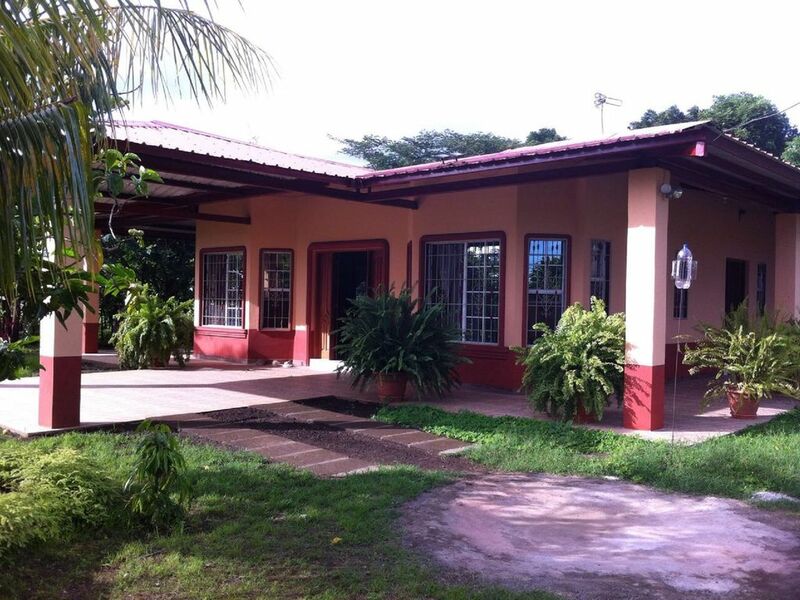 Colonial House, build in 2014; 3 bedroms 1-1/2 bath, kitchen, dining, living room & parking, spacious rooms & corridors. Fruit trees, nature & nice weather; Vigilante 24 hours and water tank. Located 1 km from Jinotepe. 40 km. from Managua, 20 min. from La Boquita & Casares (beach). Ideal for relaxing, get out of the noise of the city and enjoy nature with a lot of fruit trees: plantain trees, mangos, lemons, coconut, etc. and flowers; wake up with the singing of the birds; hammock (by request), seating area outside in the porch and corridors. Spacious bedrooms: two rooms are equipped with a full size bed, closet, fan and lamp. One room has two single beds. Supermarket Pali, La Colonia and Mercado are about 10-15 minutes walking; restaurants and shops. Close to tourist sites and crafts, such as Masaya, Granada and Rivas. Volcan Mombacho, rivers and beach, and ecological sites. Enjoy traveling, friendly, honest, and most of all would like to show you Nicaragua! Our home is very comfortable; a perfect place to enjoy nature and relax, being close to the city but yet have the opportunity to listen to the bird singing to you in the morning. Try our fruits: coconuts, mangos, lemons, plantain, bananas, and more. Nice weather in the evenings and mornings is cold, sometimes you need to wear a sweeter. Big tree in the neighborhood (El Ceibon) great for relaxing and read a nice book. Great spot outside of Jinotepe with beautiful grounds. Clean and safe. The house was well cared for and clean. It would be difficult to find the house without incredible directions. It sits outside of town and the roads are rough tracks with no markings. This would be a difficult property if you don't rent a car. The beds were comfortable but the living room furniture was very rustic. There is only cold water - like most homes in Nicaragua. We enjoyed our stay. Thank you! Hope you and family had a great time during your stay in Nicaragua. Near several attractions: Huehuete and Casares Beach, Escalante River, waterfall La Culebra, Ecoturismo La Maquina. Close to Masaya, Granada, San Marcos, Managua and Rivas.